Peel/core apples and cut into thick slices. Toss together the apples, brown sugar and cinnamon either in a bowl mix until well coated. Cook apple mixture with 2 tbls. of water and 1 tbls. 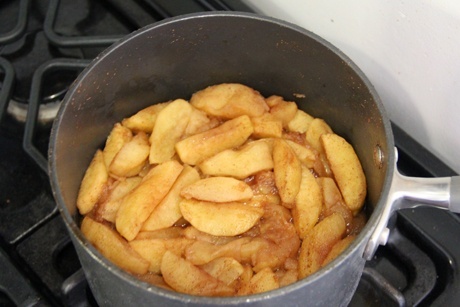 of butter in a medium-sized saucepan over medium heat, stirring occasionally until apples are tender (8-10 minutes).